This is the second of four posts from Aurelia. I like my neighbors, probably because I hardly hear or see them. One of them is actually really friendly. She gifted me sweets for Divali (the Hindu festival of lights, in its importance equivalent to Christmas), and invited me over when they had a pujari (a Hindu priest) coming to their house to perform a pooja (a Hindu ritual). The others just greet me, but I can see the different look no their faces, and I don’t want to scare them further. * Hindi for ‘I see, I understand’. Anyways, there’s the 4th door, and I don’t know who lives there. 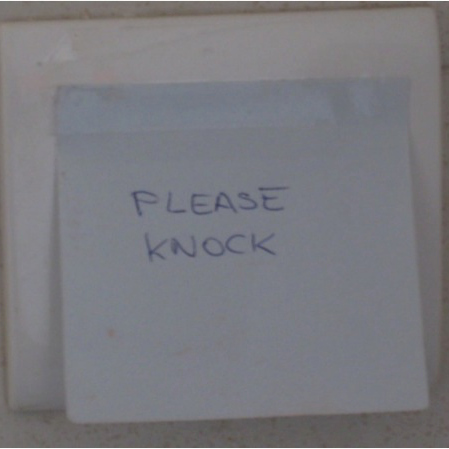 But one day, I noticed a sticky note on their doorbell. It said ‘Please do not ring the bell’. I found this rather curious. I really don’t understand why you would make it so hard on your visitor. 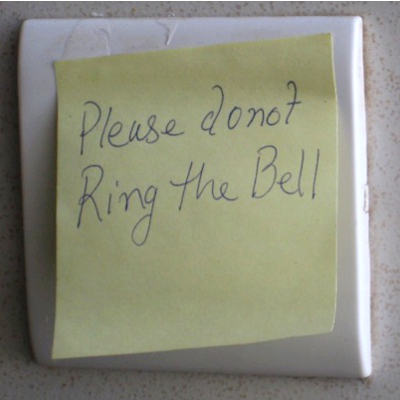 I didn’t give it much thought after that, until one more neighbor stuck a very similar note on their bell.